The disaster at Fukushima Daiichi appears to have no end in sight. The extensive clean-up effort is absolutely necessary, but the Japanese government and Tokyo Electric Power Company (TEPCO), the owner of the Fukushima Daiichi atomic reactors, have seriously underestimated the cost. 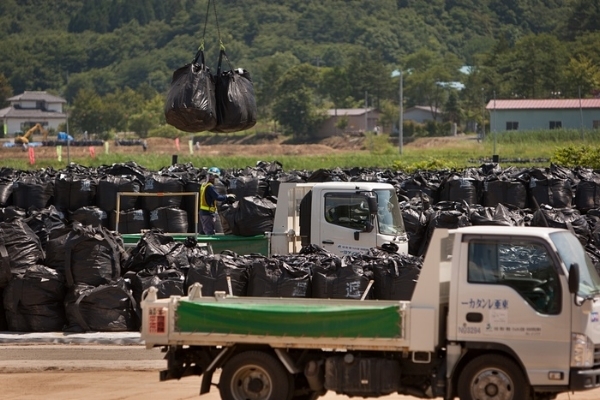 Initially, back in 2011, TEPCO and the Japanese government estimated the clean-up costs at approximately $50 billion. Now the Trade Ministry of Japan, which oversees nuclear power operators and sites, believes that the costs may be closer to $180 billion, almost quadruple the first estimate. Fairewinds Chief Engineer Arnie Gundersen has long forecast that the final cost of the clean up of the Fukushima Daiichi site and the surrounding residential area and cities it contaminated will be closer to $500 billion by the time everything is said and done. The recent robotic expeditions (February 2017) into Fukushima Daiichi Unit 2 have failed to locate the fuel and have only proven just how radioactive it is inside the containment due to the destroyed nuclear fuel. In addition to taking alarming pictures of the meltdown area, which have never been seen before at any atomic reactor, the robot was also measuring radioactivity. At one point, the robot measured 530 Sieverts/hour (Sv/hr), which is an amount of radioactivity that is so lethal a person would die after only one minute of exposure! Additionally, other parts of the containment are believed to have levels as high as 1,000 Sv/hr. Cleary, getting workers inside the containment to clean up the reactors and start the decommissioning process is not possible at this point in time. Using robots to start the clean up is also not feasible as the radiation levels are so high that even specially designed robots can only survive for a maximum of 2-hours before they begin to malfunction. There is no roadmap forward to clean-up the Daiichi site. There isn't anything the Japanese government, TEPCO, or the site workers can do in the immediate future that would enable the removal of the molten fuel from the floor of each reactor’s containment and then actually start the decommissioning process. In short, Fairewinds’ recommendation is to let the plants sit for 100 or more years until the reactors are less radioactive. In the mean time, the focus should be on stopping groundwater from infiltrating into the containment buildings and migrating to nearby environmentally sensitive areas and the Pacific Ocean. The leaking and migrating radiation must be contained. For example, factually we know that the fuel cores of each reactor are in direct contact with groundwater. As the groundwater flows through and past each core, it picks up radioactive material before ultimately ending up in the Pacific Ocean. About 300-tons of highly radioactive water enters the sea EACH day, endangering marine life and people who depend on the ocean as a food source as the radiation travels up the food chain and enters our bodies through the consumption of Pacific seafood in a biological process known as bioaccumulation. Ensuring that the groundwater is stopped from entering the containment buildings should be TEPCO’s first priority. After six years of smoke and mirrors, TEPCO’s infamous Ice Wall is still failing to stop groundwater from entering the containment facilities. TEPCO has also built walls along the sea to keep water from entering the Pacific, which have also failed. Fairewinds has been contacted by numerous oil-drilling experts who know of chemical injection processes (drilling mud) used in their respective industries that would have stopped the groundwater intrusion and migration more than three years ago. TEPCO and its Japanese regulators have chosen not to listen. Think of an overflowing bathtub. TEPCO is trying to build the sides of the tub higher, when a better solution would be to turn off the tap by injecting drilling mud! As soon as the issue of groundwater intrusion and migration is stopped at the Fukushima Daiichi site, entombment of the reactors, similar to what was done with Chernobyl, should be TEPCOs next step. Filling the containment with concrete to prevent the radiation from being released is the best solution as the reactors are simply too radioactively hot for either robots or people to handle and dismantle. Each reactor should remain in the sarcophagus for at least 100 years until the radiation levels are low enough (have decayed enough in nukespeak) to safely remove the fuel and begin dismantlement. TEPCO believes they can have the Fukushima Nuclear Power Plant decommissioned and the area around the plant suitable for habitation in thirty to forty years. We at Fairewinds believe this would be a rushed job that would expose too many Japanese workers to high radiation, release even more radioactivity into the air we all breathe, and that proper safety precautions would be skipped in favor of getting the job done as soon as possible. We need to do this right to ensure that the lives of the workers, their families, the Fukushima refugees, and that the fragile environment of the Fukushima Prefecture and adjacent cities and towns are valued more than TEPCOs bottom line.